Making their New York debut, Atelier Alain Ellouz recently participated in the prestigious ICFF (International Contemporary Furniture Fair), North America’s biggest interior design showcase. 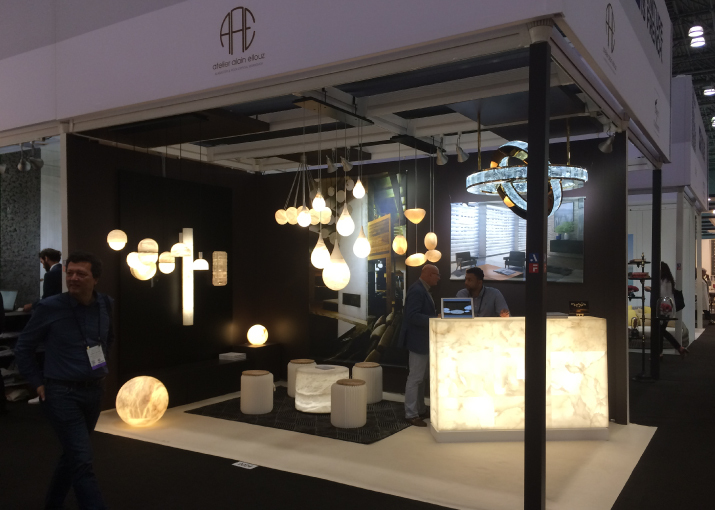 Running from the 21st – 24th May 2017, Atelier Alain Ellouz were there to exhibit their stunning new alabaster and rock crystal light fittings and furniture, which were hugely well received by American design enthusiasts. Given no other such company in New York is currently working with these exquisite materials, attendees were intrigued to see what AAE had to offer. On the back of such a successful trip, Atelier Alain Ellouz have announced plans to open a permanent showroom in the iconic city in early 2018. One can see why French interior design is so enticing to the New York client: every step of the production process is overseen in-house – hence the attention to detail is second-to-none. Furthermore, the calibre of raw materials used – such as the highest quality of alabaster and rock crystal in the case of Atelier Alain Ellouz – gives the finished product an air of unparalleled quality. Which is somewhat essential, considering how selective and uncompromising style-conscious New Yorkers reputedly are. The exhibition was an exciting opportunity for the company to debut some of their latest pieces. This included some new additions to their range of signature chandeliers, which offer a fresh and contemporary alternative to the traditional Baroque-inspired designs one normally associates with this type of fixture. 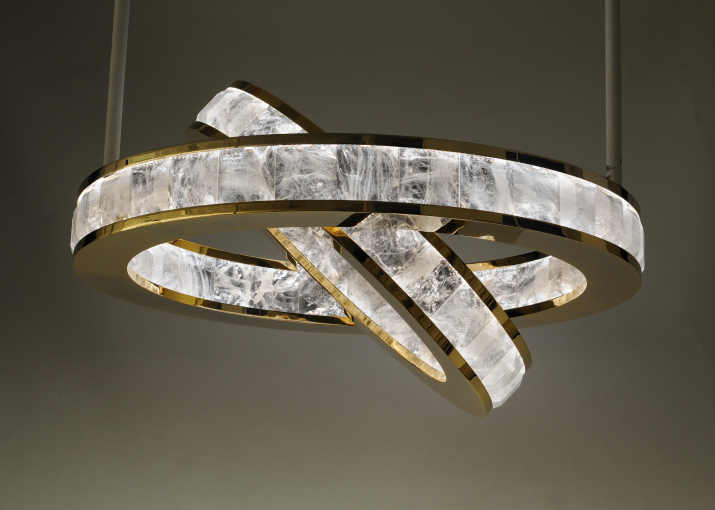 Unique elements, such as the luminous, translucent nature of alabaster stone, are what makes Atelier Alain Ellouz’s bespoke light fittings so unique – the light allowing the beauty of this material to be showcased at its finest. New designs on display ranged from delicate teardrops of alabaster ‘Chandelier Prague’; to the multi-orb ‘Chandelier Bolky’ design. Also making their debut were the sculptural ‘Chandelier Galet’, ‘Chandelier Yoko’ and ‘Chandelier Yum. More statement creations included ‘Chandelier Elysee’ – its name paying homage to Paris’s iconic fashion quarter. This design resembles an exquisite piece of jewellery, with two rings – one nested inside another – each set with 140 large rock crystals, to dazzling effect. As well as lighting, furniture pieces included the exquisite alabaster bar inlaid with Lalique glass, together with the Art-Deco-inspired Foehn Wall Lamp. Having worked with the likes of Louis Vuitton, Chanel and Guerlain, Atelier Alain Ellouz have already conquered the world of French interiors and it seems a move across the pond to capture the New York market was only a matter of time. 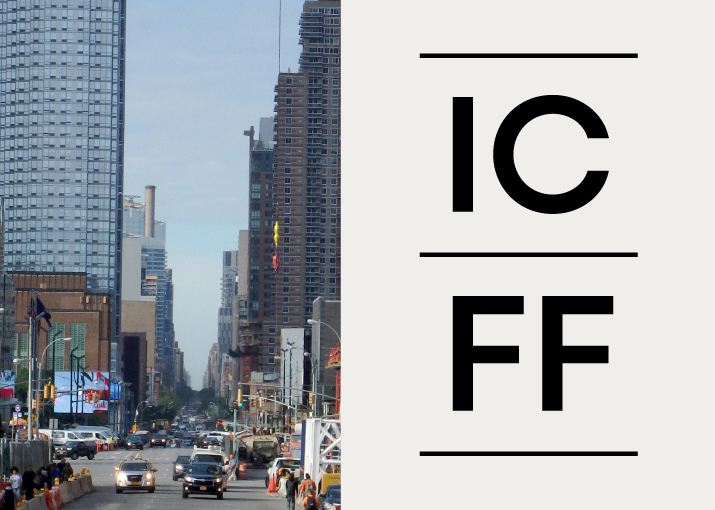 With such a warm reception from ICFF (with nigh on twenty direct requests for product commissions), it is clear they have a captive audience for this style of craftsmanship. Atelier Alain Ellouz plan on returning to ICFF in 2018, with plenty more stunning creations to keep the American market transfixed. Continue to follow our social media pages for the latest news on our New York showroom.